Rep. Alexandria Ocasio-Cortez (D., N.Y.) on Thursday slammed Glenn Kessler, a columnist for the Washington Post‘s "Fact Checker," after he gave her a "Three Pinocchio" rating. Kessler published a fact check Thursday morning in response to Ocasio-Cortez's comments earlier in the week about minimum wage and a living wage. He rated it false, but Ocasio-Cortez blasted the research he used in the fact check. "If the point of fact-checking is to enforce some objective standard, why would @GlennKesslerWP use a Walmart-funded think tank as reference material for wage fairness?" Ocasio- Cortez tweeted. "That’s like citing the foxes to fact-check the hens." The author of the study that Ocasio-Cortez implied was corrupted by corporations is former President Obama's chairman of the Council of Economic Advisers, Jason Furman. Kessler pointed this out in a pair of reply tweets that added further information. "He's someone I have known for 20+ years and he is simply citing some basic economics. I included the link only because his discussion of the economics was detailed and thorough," Kessler tweeted. "He also included some caveats which were too complex to include in that section of the fact check. So I included the link so readers could learn more. But focus on the author — who in his time in govt spent a lot time on addressing income inequality." Ocasio-Cortez's original statement came during a discussion with progressive author Ta-Nehisi Coates. "I think it’s wrong that a vast majority of the country doesn’t make a living wage, I think it’s wrong that you can work 100 hours and not feed your kids. 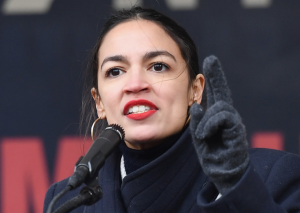 I think it’s wrong that corporations like Walmart and Amazon can get paid by the government, essentially experience a wealth transfer from the public, for paying people less than a minimum wage," Ocasio-Cortez said. The Post first looked at Ocasio-Cortez's claim that "a vast majority of the country doesn't make a living wage." Acknowledging that the answer to this question is "not easily found," the fact check concluded "Ocasio-Cortez would have been fine if she had said ‘more than a third' or even ‘almost half.'" She was wrong, however, to suggest "a vast majority" of Americans do not make a living wage. As for Ocasio-Cortez's talk about corporations experiencing a wealth transfer from the public for paying people less than a minimum wage, the Post said this is where the congresswoman "starts to go off the rails." Both Walmart and Amazon, which she cites, pay employees more than the minimum wage. This isn't the first time that Ocasio-Cortez has criticized Kessler or fact checkers. Earlier this month, she targeted the Post and Politifact, saying "false equivalency [and] bias creeps in" to their fact checks of her. She also went after Politifact for giving officials' statements "true" ratings frequently, naming Gov. Andrew Cuomo (D., N.Y.) as an example. "I say true things all the time – I’d hope most do. When does Politifact choose to rate true statements? Is there a guide? I’d be happy to repost if there is," she said.